This is a completely customized cheerleader bride and groom playing guitar wedding cake topper ordered by one of our customers. They would like the groom to be in a ripped black tux, playing guitar. He has tattoos on his arms. The smaller, circular tattoo is his left arm. The right arm is the very detailed tattoo. The bride is in her white strapless wedding dress, holding blue, white, and silver pom poms. 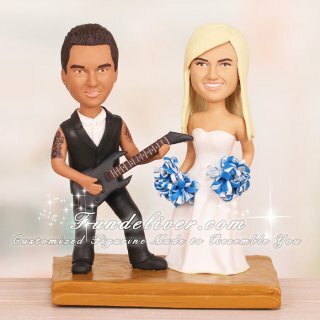 Perfect cake topper for cheerleader and guitar player.